Here we go! Another post about tahdig! So far I have posted about two methods of making tahdig, one is with yogurt and saffron and the other is with lavash bread. Today’s post is about one of probably most loved methods of making tahdig. There is something truly magical that happens when sliced potatoes are friend along with the rice at the bottom of the pot! Gather all of the needed ingredients. Some people will fry one side of the potatoes first, flip them and add some water and oil and then place rice on top. 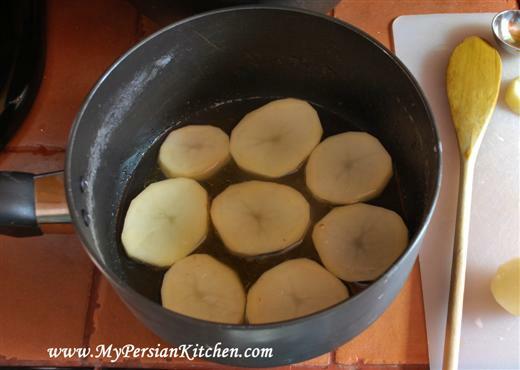 Others will simply place water, oil and saffron in the pot, place the potatoes in there and cover with rice. Personally that’s what I do. I just pour a couple of tablespoons of canola oil, then add 1 tablespoon of saffron brewed in hot water, and little sprinkle of salt and slightly shake the pan or use a wooden spatula to mix the liquid. Add the potatoes, sprinkle each with a little salt and then add rice. I highly recommend that the salting of the potatoes, at least on one side, is not skipped. It makes a huge, huge, huge difference! 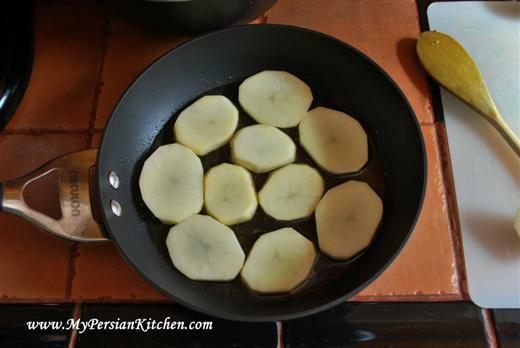 Since thadig is super popular, sometimes when I have left over potatoes, I add them to another pot or pan and make extra tahdig. Generally, when you make more tahdig you will be more loved! Add rice as you would regularly. As always cook on high for 10 minutes. Lower the temperature, wrap cover in a towel and steam for about one hour. 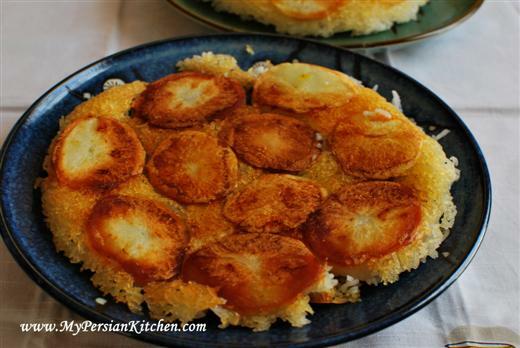 The end result is a gorgeous and delicious potato tahdig! And here is the extra one that I made in the pan! !!!! This was the first Persian dish I ever ate. I’m going to try this! @La, awesome! Let me know how it goes! Oh no! what happened? Too little oil? Too high of flame??!! It happens to to the best of us! This looks really yummy! I’ll have to try that. I’m sure my kids will be thrilled! just one question–1 tbsp saffron?? that seems too much for anything. I made this tonight and it came out slightly burned–still edible, but the potatoes were a little too well done. It was the first time making this, so hopefully next time I’ll do better. Have you ever tried using butter instead of canola oil? Does that work too? @ ap269, it is indeed yummy!! @ Maninas, it’s sinfully good! @ Cassie, I am sorry yours didn’t come out well. Make sure that you steam the rice on a low flame. Yes, you can use butter as well. I have found that canola oil works best for me as the burning accidents occur less. Do you have to cook the rice before you make the tahdig? I am trying to make a persian birthday dinner for my fiance and I have never made this before. Thank you. This is great like the rest of your site. The tahdig with yogurt and saffron link doesn’t work though. That was the reason I ended up on this page and it takes me to an error message. would you please add instructions for tahdig-e maast? This is one of my favorites. Have made it quite a few times, taste was there but could not get it to look as pretty as yours. Worked with an Iranian architect, and had an Iranian neighbor. They cooked it for me, they gave me the directions but I failed. Your recipe and techniques look like they will fix the problem. Your site is wonderful and I look forward to cooking more of your fabulous food. 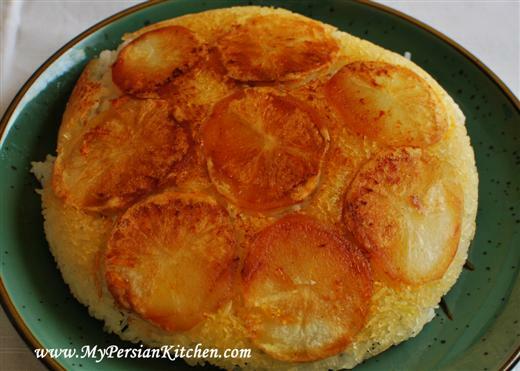 Iranian (born in Abadan) myself but for some reason making tahdig with potatoes is just always unsuccessful for me. It is so upsetting because it’s the best kind of tahdig!! My family has tried to explain the process to me many times and I feel like I’m really doing what they say but it still just doesn’t go. (agh!) Any way, sorry for the long sob story but wondered if you had any idea what might be causing this? Thanks again for your awesome blog! Neomi, thank you for your kind words. I am glad you enjoy reading my blog! Hmm, are you putting too much water along with oil at the bottom of your pot? If you have a good pot and your ratio is correct then I don’t know what is going on. If your potatoes are burnt, then maybe your flame is too high during the hour that it cooks. It’s very important to cook on high for 10 minutes and then lower the flame and allow for the rice to steam on low. Neomi, so glad to hear that your latest try was a success!!! Woohoo!!! Thank you SO much for posting this! I always love tahdig like this, but my family (parents, sibs, etc) prefers the lavash…now I make it the way I love it for myself & new family (DH, kids). I love all your photos and detailed instruction! VERY helpful. Farah, I am glad to be of help!!!!!!!! The parents of a friend of mine (Persian father, German mother) told me that when they told 15 years ago to their two children that a new brother would be born in some months, my friend was fine with the idea but he had a serious concern about having to split tahdig into 5 family members instead of 4. I can fully understand. The traditional method might be risky for some at the beginning, as you have to know well the pot, the intensity of the fire, and when to remove the rice before it gets fully done for adding it to the tahdig. The safe version is using a rice cooker. 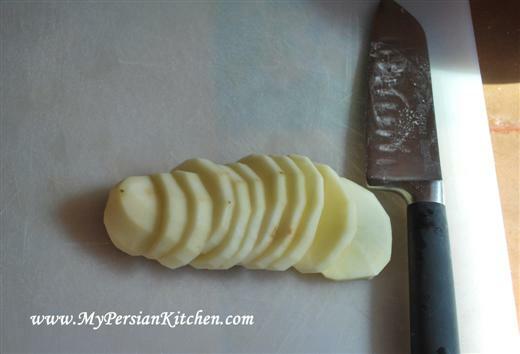 If you want it with potato tahdig, it is as simple as adding some oil or butter, salted sliced potatoes, rice and water at the right ratio depending on the type of rice, and salt. Then, press “cook” and it will stop by itself when cooked. The trick to make tahdig is to force the rice cooker to continue cooking for 7 to 8 minutes by keeping the button pressed for “cooking” mode, instead of “warming” mode, which jumps off automatically when the water have been fully absorbed. Victor, do you add the potatoes at the beginning? Don’t they float to the top? 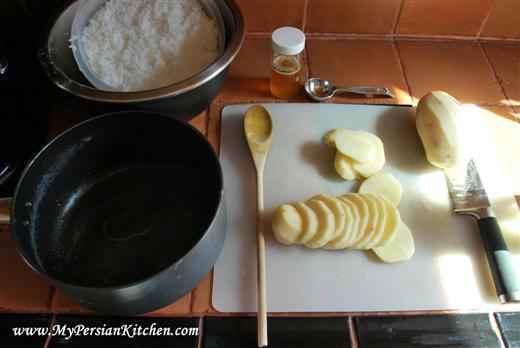 I notice that Persian do have a very different style of cooking their rice- in comparison to other cultures…. I live in a mainly Hispanic neighborhood and Carolina Rice (brand) is the only Basmati rice I have come across. Should I shop around for a different brand? Do brands really matter? And what about the cooking spices? I notice the only step you use oil in (throughout the instructions) is when you are adding it to the bottom of the pot for the Tadig. 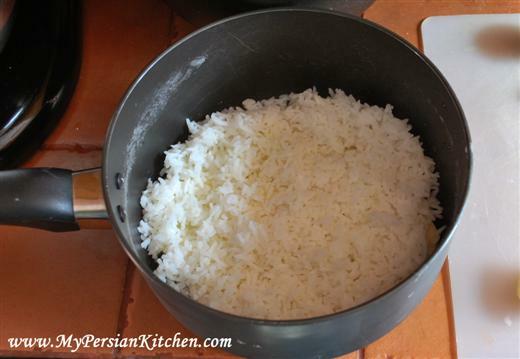 Why is it that Persian style rice does not stick together? I always thought oil was used so that the rice does not stick to the bottom of the pot AND together! Does soaking it overnight/several hours contribute to the grains not sticking together? When soaking the rice, should I put it in the fridge! When it comes to draining the rice, do I drain/strain the rice until all excess water is completely out of the rice? I absolutely LOVE Persian food.. unfortunately I have no one around to give me these little pointers! Your website is Fantastic By the way!!!! Cant wait to make this Dish!!! Its will be the first! I was wondering about the part where you made extra tahdig in a pan? Do u need to put more rice on top of the potatoes? Or how do u make the extra ones? I already have rice my uncle made but would like to make tahdig?? Soraya, you need to put a thin layer of rice on top of the potatoes and follow every step of rice making minus the water and oil that is added before lowering the temperature. your recipes look so amazing and simple yet very artistic. I tried the potatoe tahdig today and i lowered the heat and left it on for anout an hour but it wasnt crispy , or even close. the potatoes were soft , tasted good but they were not crunchy. Maha, it definitely sounds like there was too much water at the bottom of the pot. Make sure that there is enough water just to cover the surface of the pot. Practice definitely makes perfect! Happy to tell u that i did the tahdig with potatoes today and it was perfect. I dissolved the saffron in less water, and increased the oil at the bottom of the pan a little. Great recipe. Great blog. I stumbled upon an article on iranian.com while desperately searching for an easy way to make a good tahdig. check out the poem about our beloved tahdig at the end of the article. I made this for my boyfriend last night and I have got to say that I am getting better at making tahdig. However, I am sook nervous my sister in law is coming from tehran on Tuesday and I know I am no match for her Persian cooking. Beverly, don’t be nervous! You are trying your best and that is all that matters!! 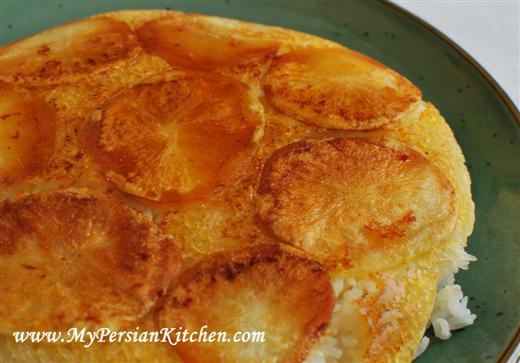 I used this recipe, plus a phone call to my dad, and my first tahdig turned out wonderful! I am finally learning to make the Persian food that I ate as a kid and this website is a huge help! Thanks so much! Reena, to make a good tahdig you need a non-stick pot and canola oil. The trick to a good crispy tahdig is to have enough oil at the bottom! I just ran across your blog while searching for a recipe for mast-e-khiar. I love Persian food. Once upon a time I was married to a Persian and lived for a while in Iran. Potato tadigh is one of my favorites, and I make it as Baghali Pilau (sp?). My non-Persian boyfriend absolutely loves it, too. I’m fortunate… mine usually comes out looking, tasting good. I use butter in the bottom; and before I put the lid on I make a little well on top in the center and put some more butter, as I was taught. The way Persians cook rice is wonderful… never sticky. I never liked eggplant until I ate khoreshte bademjan and now I love any way eggplant is cooked. Anyway, just had to put in my two cents. Thanks for taking me back to such good food. Now this looks like something i’d like to try.